Nutshell review: “The Nowhere Child” was a cracking read. I’ve tried to keep this review as spoiler-free as possible so you can read it without too many preconceived notions about the plot, characters, or other details… because with a novel like this it’s easy to drop spoilers completely by accident. The concept of this novel had me interested from the outset, because it poses a fascinating hypothetical question. None of us can remember very much of our early childhoods, meaning that we can only rely on documentary evidence and the memories of our parents, siblings, and others for details of our lives before we began to form permanent memories. What if everything we were told was a lie? That’s the reality faced by Melbourne photographer Kim Leamy when a an man seeks her out to say he believes she’s someone else, a child who went missing over two decades ago from a small town in the United States of America. The novel alternates between the present and the past as it unfolds what happened to Kim and why. The way the author handled the two time periods is one of my favourite things about the book. On the one hand, it would have been very easy for details drip-fed to the reader in the past section to spoil revelations and surprises in the present. On the other, it would also have been easy for the withholding of details or the provision of misleading details to feel cheap and cheesy, done just to maintain surprises in the present. For the most part, White did an excellent job of balancing these two risks. Information from the past gently misleads the reader on occasion, but in a way which is fair and reasonable given the unfolding situation. Characters in “The Nowhere Child” are drawn very well indeed. Even the most unlikable of characters are somewhat sympathetic, while the cast of generally likable individuals is likewise not without its flaws. The book does a fine job of ruminating on the subject of loss and grieving, and I also felt that the locations and times featured in the novel were evoked well, without going into enough detail to distract from the ongoing narrative. My favourite element in the novel was the way it didn’t shy away from the fact that three of the characters involved in the narrative are not heterosexual, and the way in which it portrayed their trials and tribulations living in a small town with a strong religious community. 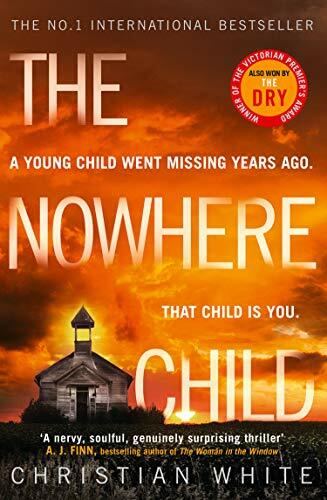 I definitely recommend “The Nowhere Child” to you if you’re a thriller fan. I chewed through the book in no time at all and I was always keen to find out what was going to happen next!